Credit subject to status and affordability. Terms & Conditions Apply. 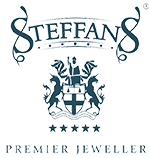 Steffan the Jeweller Ltd trading as Steffans is a credit broker and is Authorised and Regulated by the Financial Conduct Authority.